Con Intel: ECCC 2018 Dates Revealed! Right now we’re still waiting on the date for ticket sales for Emerald City Comic Con (ECCC) 2017, to be held March 2-5, 2017. But even so, it would appear that the Convention Center is already reserved for ECCC 2018. 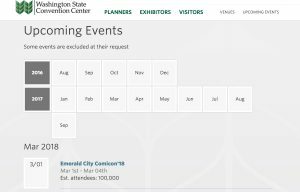 According to the convention center calendar, ECCC 2018 will be held the same weekend: March 1-4, 2018. Start making your plans! In the meantime, badges for ECCC 2017 are expected to go on sale in mid-October (probably after parent company ReedPop finishes its flagship New York Comic Con show).